Tomb Raider | John Caldwell – Chairman, Entertainment Reporter, Australian of the Year in Victoria 2014, Author, Film and TV producer. Read John Caldwell’s blog, see photos and keep up to date on the latest news. Official John Caldwell site. If you are anything like me you would have been certain that no one could fill the shoes of Angelina Jolie in this reboot of Tomb Raider, I can now confirm that we were wrong. As our staple actors start to age and take more sensible roles I often panic that there isn’t anyone coming through the ranks who can fill their shoes especially strong heroic women but I can firmly say that Alicia Vikander was stunningly brilliant as Lara croft. While Oscar winner Vikander has proved her worth in Hollywood I think this script and indeed this style of move took her a long way from Oscar ville. In fact I would go as far as to say that she really didn’t have much to work with in terms of showing her incredible acting prowess. That said there is one scene where Lara has to kill for the first time and right there at that moment you’re reminded why Vikander is an Oscar award winning actress. The film is a contradiction for me as there are so many areas that I truly enjoyed and others that annoyed me to the point of scoffing out loud. With that said I do think they followed the recipe for films of this genre and die hard’s should really enjoy it. 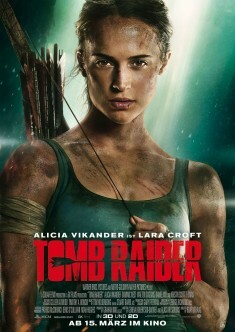 The plot of the film is largely based around Lara searching for her father and on the way discovering she has a certain skill set and determination she hadn’t quite realized she possessed. While touching,I do think there could have been some deeper story lines to the film although it becomes apparent at the end that there was in fact a story line where Lara was saving the world even though that wasn’t her intention. There are some very cool fight scenes that look very realistic and there’s good reason for that, they actually were. Vikander transformed her body with multiple trainers adding 6kg of muscle and actually performed the fight scenes including taking punches to the face. The not so realistic parts however seem to be the sets and the visual effects. At times I felt like I was on a movie studio tour where you can almost see how they make it look real and yet it looked very fake. What saved this was some really great nail biting scenes and some great acting so you tend to drift back into fantasy land instead of dwelling to long as a skeptic. While Lara was a strong powerful woman and held us captivated for the most of the film the ensemble cast of men were really robbed by the script and were a massive contradiction. The leading man played by Daniel Wu who was supposedly there for Lara and standing by her barely featured and when he did stand up to protect her I am not sure what he did as the film cut away from him. He then moved a few rocks and that pretty much summed up his heroic or rather not so heroic role. By far the most disappointing of all characters was the supposed villain Mathias Vogel, played unconvincingly by Walton Goggins. Far from a scary villain this character was more like a sniffling little boy whose daddy had taken his toys. Had he not had weapons he would have not been intimidating in any way. The area that disappointed me in this film the most was how far back I felt Lara’s character was taken by way of a strong women. There seemed to be a strong undertone of misogyny with almost every character flirting with her including those who wanted to kill her. I felt a lot more energy could have been focused on her impressive skills and determination than her looks and sexuality. I am most certainly overthinking this movie for what it is and what it is supposed to be as I did with the last one. It’s important to point out that if you like this genre of film you will NOT be disappointed. To take a serious approach to a movie like this would simply be foolish. I personally think it lives up to the last film and is an enjoyable, exciting and adventurous watch.